Teenagers: they roam in packs, mope silently in their rooms, sneak out, talk back, sneer, yell, roll their eyes, and think their parents just might be the dumbest creatures on Earth. Raising a teen is perhaps the most challenging phase of childrearing, a time when kids push every known hot button and wreak havoc with carefully thought-out parenting strategies. 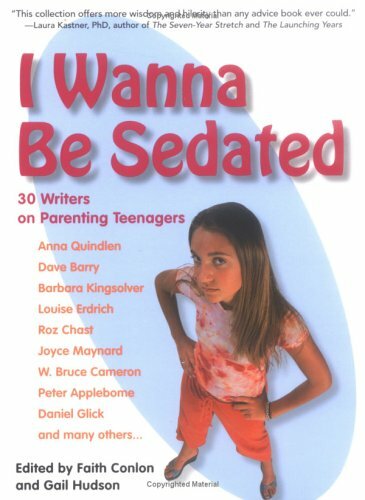 I Wanna Be Sedated brings a sense of humor and perspective to some of the deepest worries of parents. Joyce Maynard explores the house rules for boy-girl sleepovers in “The Girlfriend Sleeps Over,” Dan Glick writes about drug dilemmas in “I Definitely Inhaled.” Debra Gwartney speaks candidly about every parent’s worst nightmare in “Runaway Daughter.” And, Anna Quindlen reflects upon her rapidly emptying nest in “Flown Away, Left Behind.” Featuring dynamic, top-caliber writing, this delightful collection speaks to the challenging, exhilarating, and occasionally mind-blowing task of parenting teenagers.